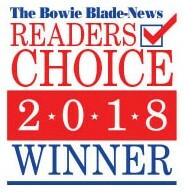 Byrd & Byrd LLC was voted the “Best Attorneys” in Bowie by the Bowie Blade-News Reader’s Choice Awards for 2018. Readers from Bowie voted for their favorite businesses and services from around the area and Byrd & Byrd came out on top for the area’s Best Attorneys. This marks the NINTH year in a row that Byrd & Byrd has been crowned with this honor. Thank you to all who voted for us and we will strive to serve our community even better in the years to come! Call us today at 301.464.7448 for a visit with the Best Attorneys in Bowie.